Cell membrane or plasma membrane is present beneath the cell wall. It is very thin and flexible. It completely surrounds the cytoplasm. Chemically, it is composed of phospholipids and proteins. Plasma membrane is very delicate in nature. Any damage to it results in death of the organisms. The bacterial cell membrane is different from the eukaryotic membrane. It lacks sterols like cholesterol. Cell membrane regulates the transport of proteins, nutrients, sugar, electrolytes and other metabolites. The plasma membrane also contains enzymes for respiratory metabolism. mesosomes. Mesosomes are in the tbrin of vesicles. tubules or lamellae. Mesosomes are involved in DNA replication and cell division. Some mesosomes are also involved in the export of exocellular enzymes. Respiratory enzymes are also present on the mesosomes. (b) Photosynthetic membranes: The membrane forms tubular or sheet like infoldings in photosynthetic bacteria. These infoldings contains enzymes for photosynthesis. The cytoplasmic matrix is a substance present between the plasma membrane and the nucleoid. The membranous bound organelles and cytoskeleton (microtubules) are absent in the prokaryotic cytoplasm. It has gel like structure. Small molecules can move through it rapidly. The plasma membrane and everything present in it is called protoplast. Thus the cytoplasmic matrix is a major part of the protoplasm. Other structures like chromatin/nuclear body, ribosomes, mesosomes, granule and nucleoid are present in this matrix. The nuclear material or DNA of bacteria aggregates to form irregular shaped dense body called nucleoid. Nuclear membrane is absent in bacterial cell. The order Planctomycetes is an exception. They have a membrane around their nucleoid. The nuclear material or DNA is present near the centre of the cell. This nuclear material is composed of single, circular and double stranded DNA molecule. Very little protein is associated with DNA. Bacterial chromosome is called gonophore. Nucleoid is also called nuclear body, chromatin body or nuclear region. It has very long molecule of DNA. This DNA is tightly folded and fit inside the cell components. Bacteria has single chromosome. So bacteria are haploid. Nucleoid is visible in the light microscope after staining with FeuIgen stain. Plasmids are circular, double stranded extra chromosomal DNA molecules in bacteria. Many bacteria contain plasm ids in addition to chromosomes. They are self – replicating bodies. Plasmids are not essential for the bacterial growth and metabolism. Plasmids contain drug and heavy. metals resistant genes. Disease and insect resistant genes are also present on them. Plasmids play an important role in conjugation. Ribosomes are composed of RNA and protein. Some ribosomes are also loosely attached with the plasma membrane. Ribosomes are protein factories. There are thousands of ribosomes in each healthy growing cell. The ribosome of bacteria (705) is smaller than the ribosomes of eukaryotes (80S). Bacteria live in an environment where nutrients are in short supply. The bacteria try to store extra nutrients when possible. This storage material may be glycogen, sulphur, fat and phosphate. The cell also contains waste material. This waste material is excreted later on. Common waste materials are alcohol, lactic acid and acetic acid. (a) Etospores: These are produced out side the vegetative cells. (b) Endospores: These are present within the vegetative cells. Its example is Bacillus. They are produced at later stages of growth. Spores are resistant to adverse environmental conditions like light, high temperature, desiccation, pH and chemical agents. They grow under favorableconditions and form new vegetative cells. Cysts: Cysts are dormant, thick- walled and desiccating resistant structure. These are present in certain bacteria like Azotobacter. They develop during reproduction of vegetative cells. Such cells germinate only under suitable conditions. They are not heat resistant structures. Bacteria are classified in to three categories on the basis of their shapes. These shapes are cocci, bacilli and spiral. Most of the bacteria have constant shapes. Some bacterial cells are pleomorphic and exist in different shapes. Cocci are spherical or oval bacteria. They have different arrangements. These arrangements are based on their plane of division. Diplococcus: In this case, division occur in one plane and cocci occur in pairs. Strptococcus: In this case, division also occurs in one plane but the cocci forms long chain of cells. Tetrad: When division of cells occurs in two planes, it will produce a tetrad arrangement. A tetrad is a square of 4 cocci. Sarcina: When division occurs in three planes, it will produce a sarcina arrangement. Sarcina is a cube of 8 cocci. Staphylococcus: When division occurs in random planes, it will produce a staphylococcus arrangement. In this case, the cocci are arranged irregularly like clusters of grapes. Examples: Diplococcus Pneumoniae. Staphylococcus aureus. Bacilli are rod shaped bacteria. Bacillus is a single cell of bacteria. There are following arrangements of bacilli. 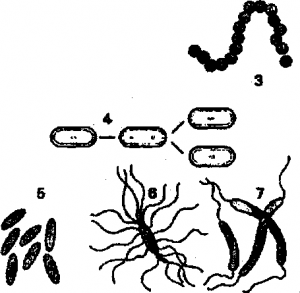 a) Streptobacillus: Streptobacillus is a chain of bacilli. b) Diplobacilli: When bacilli occur in pairs, then the arrangement is called diplobacilli. Examples of bacilli: Escherichia coil, Bacillus subtilis, Pseudomonas. a) Vibrio: It is a curved or comma-shaped spiral. b) SpinBum: It is a thick rigid spiral. c) Spirochete: It is thin, flexible spiral. 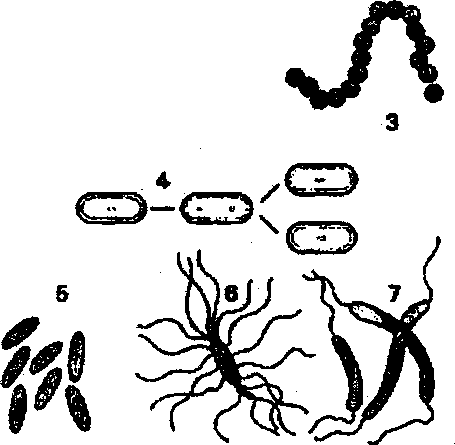 Examples of spiral bacteria: Vibrio, Hyphomicrobium. sheath that contains many individual cells. Certain types like genus Nocardia, even form complex, branched filaments. These filaments similar in appearance to fungal mycelia. Biofilms: Bacteria often attach to surfaces and form dense aggregations called biofilms orbacterial mats. These films can range from a few micrometers in thickness to up to half a meter in depth. It may contain multiple species of bacteria, protists and archaea. Bacteria living in biofilms display a complex arrangement of cells and extracellular components. They form secondary structures such as microcolonies. There are networks of channels through these microcolonies. These channels enable better diffusion of nutrients. In natural environments, such as soil or the surfaces of plants, the majority of bacteria are bound to surfaces in biofilms) Biofilms are also important in medicine. These structures are often present during chronic bacterial infections or in infections of implanted medical devices. The bacteria protected within biofilms are much harder to kill than individual isolated bacteria.Fruiting bodies: Fruiting ‘ bodies are more complex morphological form of bacteria. When bacteria like Myxobacteria starved of amino acids, they migrate towards each other, and aggregate to form fruiting bodies up to 500 micrometres long. This fruiting body contains about 100,000 bacterial cells. In these fruiting bodies, the bacteria perform separate tasks. This type of cooperation is present in simple type of multicellular organisation. For example, about one in 10 cells migrate to the top of these fruiting bodies. They differentiate into a specialised dormant state called myxospores. Myxospores are more resistant to drying and other adverse environmental conditions.